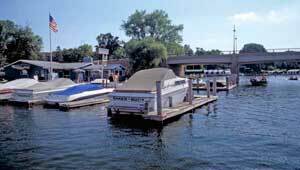 Since the 1980s, public agencies and recreationists have sought to improve public access to Lake Minnetonka, a popular boating and fishing lake 15 minutes from downtown Minneapolis. Several years ago, the owner of the private Gray's Bay Marina and Resort decided to retire. He could have easily sold the property to another private operator, but decided instead to offer the property to the state for public use. In 2001, TPL negotiated the purchase. The Minnesota Department of Natural Resources improved the property with state-of-the-art shoreline restoration and natural filtration designs for water protection, while providing free public access to area anglers and boaters. Other partners include the City of Minnetonka, the Lake Minnetonka Garden Club, the Minnehaha Creek Watershed District, and the Lake Minnetonka Conservation District.